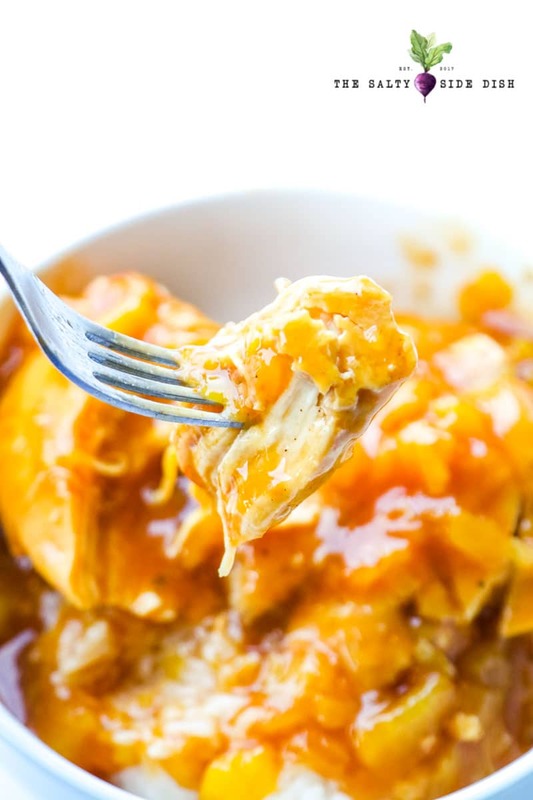 Crockpot Hawaiian chicken, otherwise known as Pineapple chicken, is an amazingly easy and filling meal that is a perfect balance of sweet and savory. 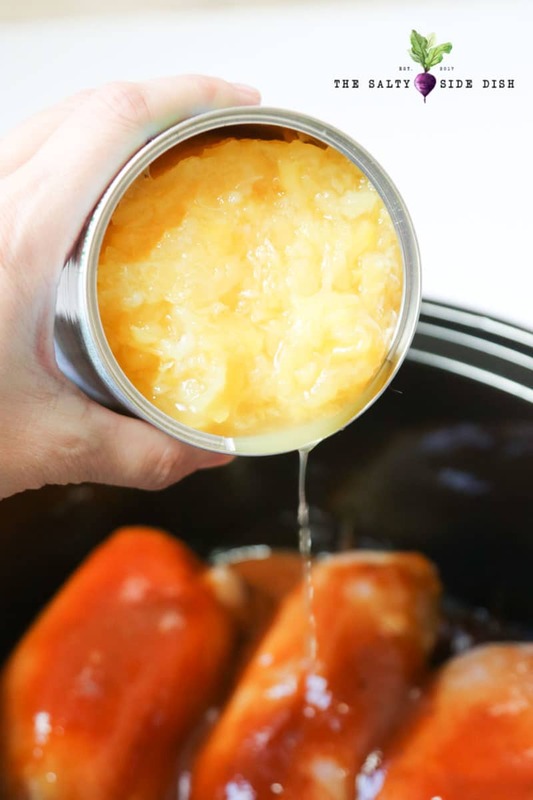 You cannot go wrong with a honey bbq sauce peppered with crushed pineapple and once its thrown into a slow cooker becomes magic at the end of the day. With all the side dishes around here I have people asking me what do I serve with some of these amazing dishes! I mean honestly you can serve side dishes AS the main dish if you ask me. But some people want protein so let’s get started on a perfect dish to serve with mashed cauliflower, Hawaiian coleslaw, southern style green beans or roasted carrots. 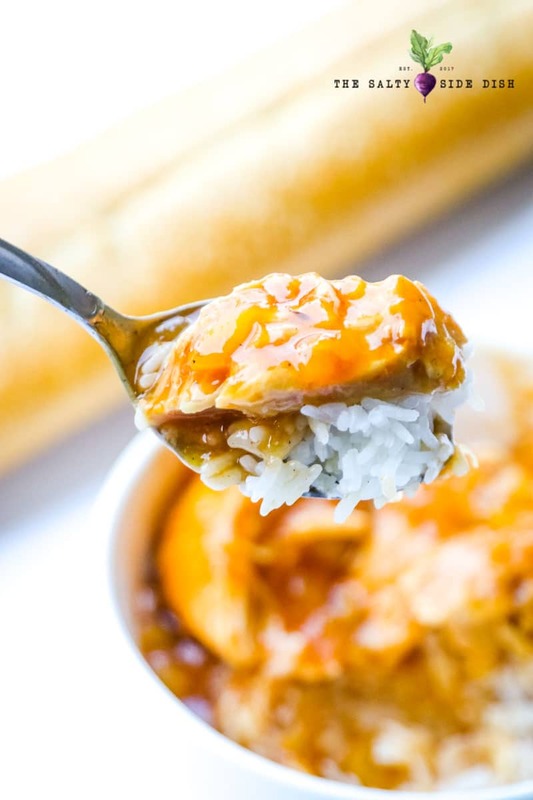 Crock-pot Hawaiian chicken is so incredibly easy to make. 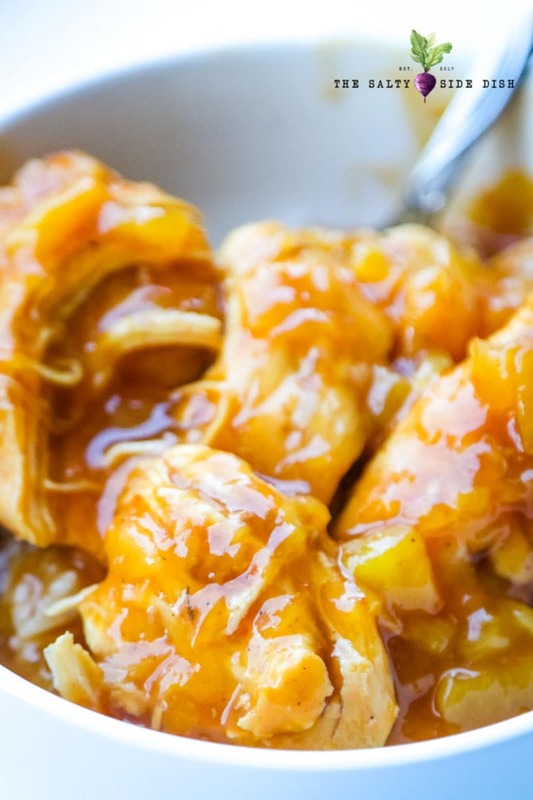 With only 3 ingredients, this pineapple chicken with the ability to dump in the slow cooker and go, it’s also one of the simplest recipes on your menu this month and makes one of my family’s favorite sweet chicken recipes of the year. You can use fresh pineapple if you prefer, just cut down into smaller chunks to make the bites easier upon serving. 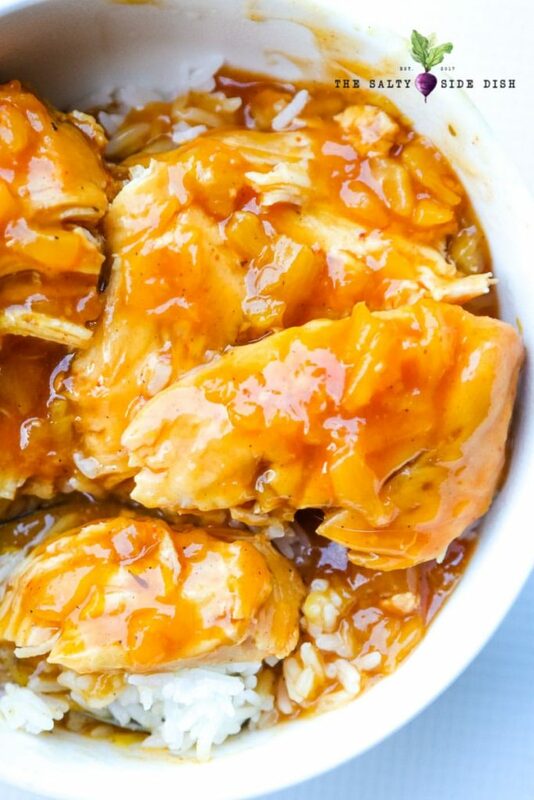 This crockpot Hawaiian chicken truly is an easy recipe. If you can turn on your slow cooker , you are in! Simply add your chicken breasts to your crock pot. Empty your bottle of BBQ sauce directly on chicken breasts, making sure they are totally covered. You can use a regular sized bottle of BBQ sauce. I happened to have half of a large one left and used that and it was plenty. 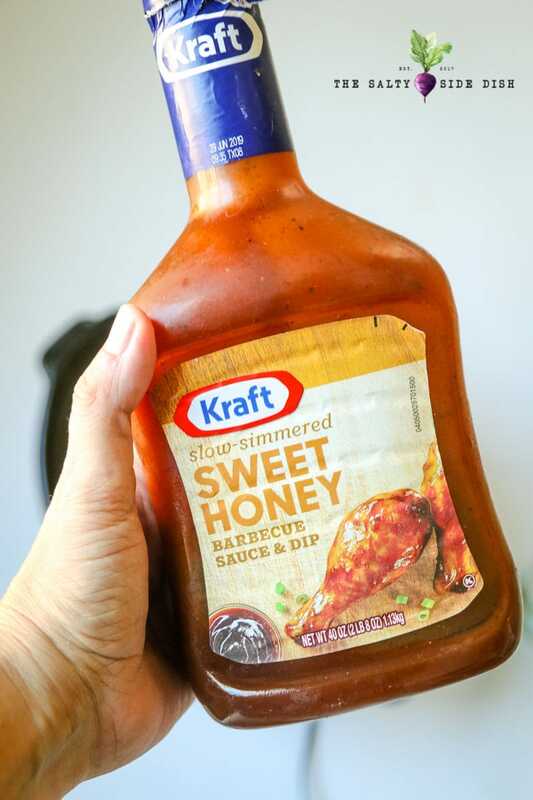 I also use a sweet honey BBQ sauce to bring out more of the sweet flavor in this barbecue chicken dish, but feel free to adjust to your own taste. Now dump your can of crushed pineapple directly in the pot. Slow cook 8 hours on low or 4-6 hours on high for soft pull apart chicken. Do you have to remove pineapple juice? Personally I do not remove or drain any excess juice in this pineapple chicken. I serve my recipe with rice and like the extra sauce to drain into the rice. However, if your chicken is cooked and you are ready to serve and feel like its too runny, you can take a tablespoon of cornstarch, add to a little bit of hot water and stir. Then add your liquid into crockpot and stir. Set for 10 minutes and it will thicken up nicely. What to serve with your Chicken? Like I noted above, I serve mine with jasmine rice, which is flavorful and delicious, but if that is too much starch for you, you can easily substitute for a side of green beans or a bed of cauliflower mocktatoes. 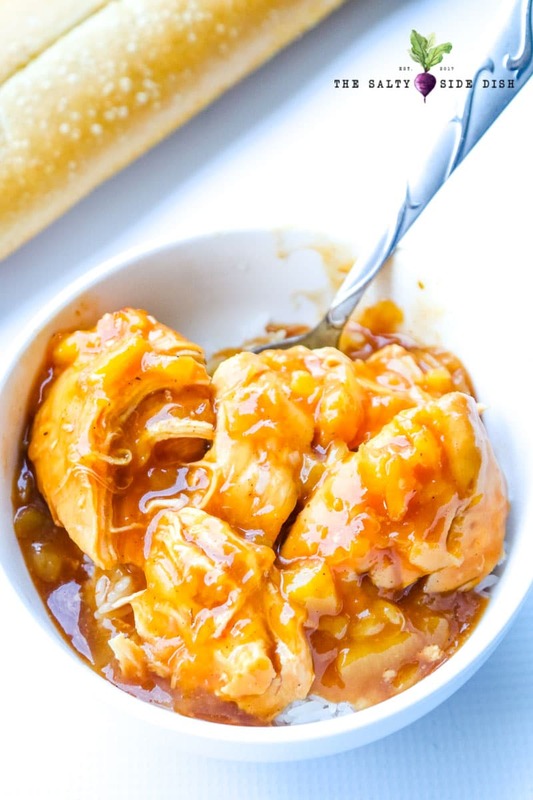 Pineapple chicken in the crockpot is an amazingly easy and filling meal that is a perfect balance of sweet and savory. 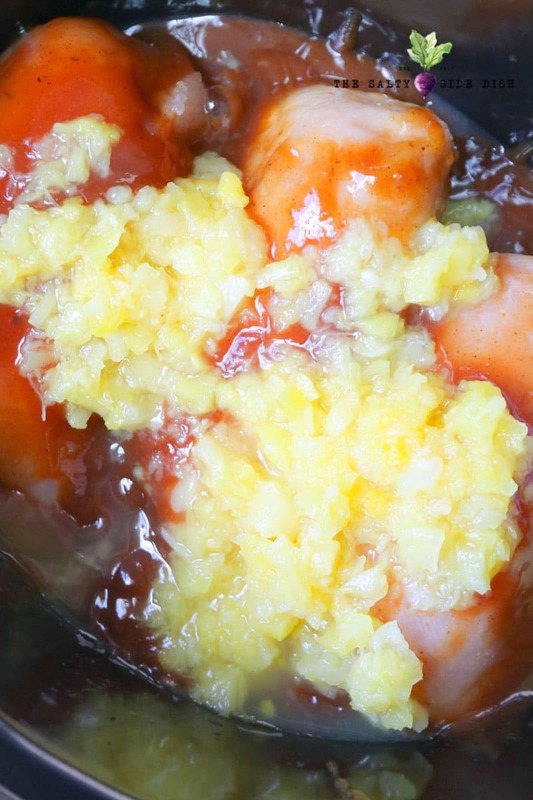 You cannot go wrong with a honey bbq sauce peppered with crushed pineapple and once its thrown into a slow cooker becomes magic at the end of the day. 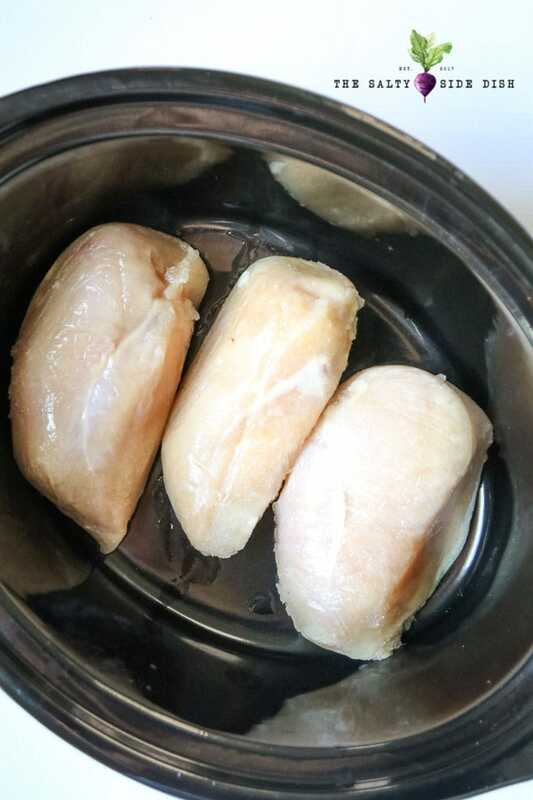 Simple add your chicken breasts to your crock pot. Empty your bottle of BBQ sauce directly on chicken breasts, making sure they are totally covered. 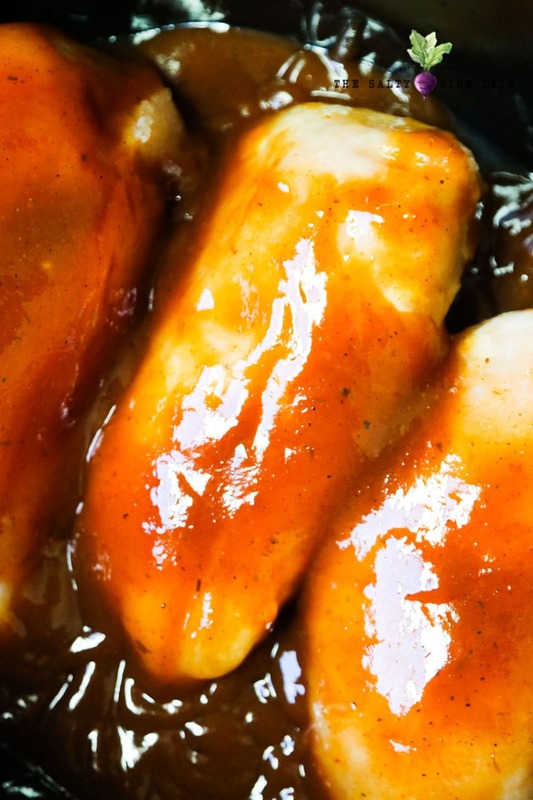 I use a sweet BBQ sauce to bring out more of the sweet flavor in this barbecue chicken dish. Personally I do not remove or drain any excess juice. I serve my Hawaiian chicken with rice and like the extra sauce to drain into the rice. If your chicken is cooked and you are ready to serve and feel like its too runny, you can take a tablespoon of cornstarch, add to a little bit of hot water and stir. Then add your liquid into crockpot and stir. Set for 10 minutes and it will thicken up nicely. I use sweetened personally . Looks good. I’m going to try this in my instant pot. Oooh! I dont have an instant pot yet! Let me know how it goes. How long would you suggest the cooking time for chicken thighs be? I have unfortunately never made this recipe with chicken thighs to let you know. Are you suppose to take the chicken out and shred it?? You can if you want, but we just take chunks out for our rice.